MOSCOW, November 21. /TASS/. 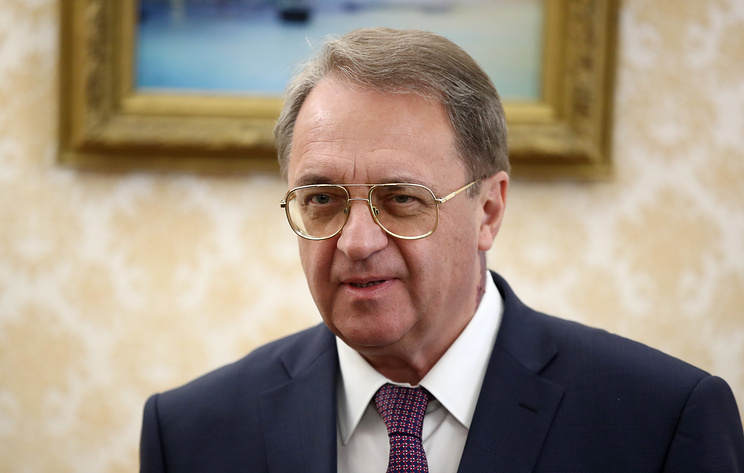 Russian presidential envoy for the Middle East and Africa, Deputy Foreign Minister Mikhail Bogdanov has discussed with Iraq's representatives the issues of energy and military-technical cooperation, the internal political situation in Iraq, and settlement in Syria, the Russian Foreign Ministry said in a statement issued on Wednesday. On November 20, Bogdanov met with Iraqi President Barham Salih, Prime Minister Adil Abdul-Mahdi and Muhammad al-Halbusi. On November 21, the Russian diplomat held talks with Iraqi Foreign Minister Mohamed Ali Alhakim and Finance Minister Fuad Hussein. "The sides discussed in detail the key directions of further development of Russian-Iraqi ties, including cooperation in the fuel-energy and military-technical spheres. In this context, special attention was paid to issues of preparing for the 8th session of the Russian-Iraqi trade commission in Baghdad in the first quarter if 2019, as well as to economic and scientific-technical cooperation," the Russian Foreign Ministry said. The sides also discussed settlement in Syria. "They also exchanged opinions on a wide range of relevant issues on the Middle Eastern agenda with an emphasis on the situation in Syria. Priority attention was given to the task of consolidating joint efforts in fighting against the terrorist threat from the Islamic State (terrorist organization banned in Russia) and affiliated radical groups, tackling channels of their financial and material support. The Russian side confirmed its unchanging commitment to provide practical assistance to friendly Iraq in the sphere of ensuring the country's security," the foreign ministry said. The situation in Iraq was discussed in the context of the process of forming new legislative and executive government branches, as well as parliamentary election in the Kurdish Autonomous Region held in October 2018. "Common understanding was emphasized when it comes to the importance of achieving national accord in Iraq in the interests of its citizens regardless of their ethnic or religious affiliation, as well as of strengthening unity, sovereignty and territorial integrity of the country," the foreign ministry concluded.